I have many an experience of buying make-up but one item I hate buying is foundation. My current foundation is one from Sephora and it costs around $20. I really like it but it is hard to get hold of and my newest bottle recently hit a grizzly end when it fell out of my make-up bag and smashed all over my kitchen floor. Well, as you can imagine, I was gutted. Devastated, even. I hit a low point and wondered how I would be able to scoop it all up and pour it back into the bottle but, like I said, it was a low point. So I needed a new foundation and took a trip to Boots where I spent an hour and twenty minutes trying to choose one. It is so hard trying to find a foundation in your correct shade when you are stood under the harsh store lighting. In the end I got so fed up with my own indecisiveness that I quickly bought two L'oreal foundations and quickly left before I could waste any more of my time. 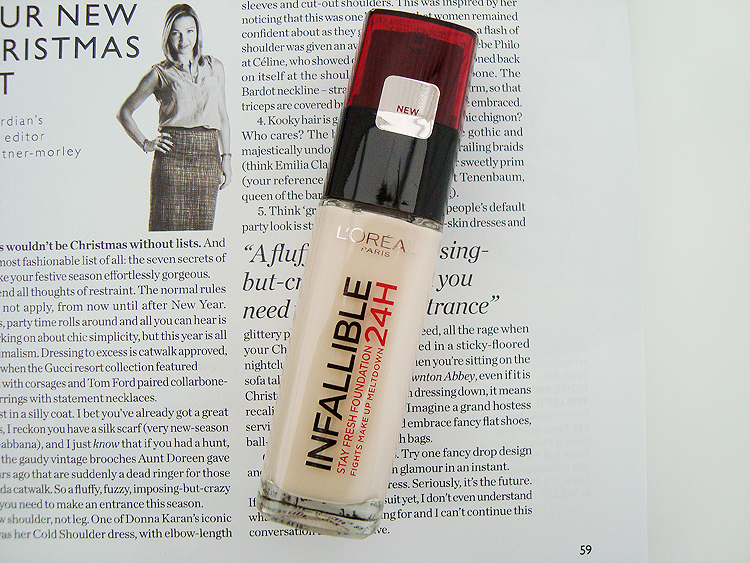 The first of the two foundations that I will be reviewing is the L'oreal Paris Infallible 24HR Foundation in Porcelain. "High coverage longwear foundation that hides the appearance of fatigue and blemishes. Now with Hydrating Hyaluron Comlex the 24HR non-stop formula is touch-proof and stays fresh for lasting comfort." I didn't really look into this foundation before I bought it so I wasn't too sure what it would be like. One of the main reasons why I bought it was down to the shade range as I find that no matter which foundation I buy, it is always too orange for my skintone. Even the lightest of shades of most foundations is far too dark for me which makes me rather self-concious when I leave the house in case I look too ridiculous. 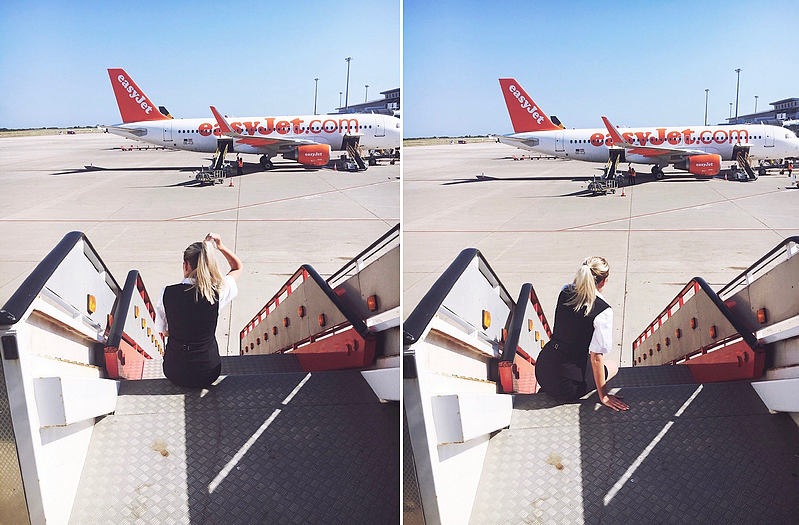 Luckily, the L'oreal Infallible Foundation range has a wonderful shade range for us pale people out there who find it hard to get the correct match foundation-wise. As much as I love my Sephora foundation, it promises to last 10HR's but I found that if I were rushing around at work and getting all hot and flustered, I would glance in a mirror and find that my face was looking a bit...red. So I knew I needed something a bit more longer-wearing and fortunately, I have most definitely found it with this foundation! 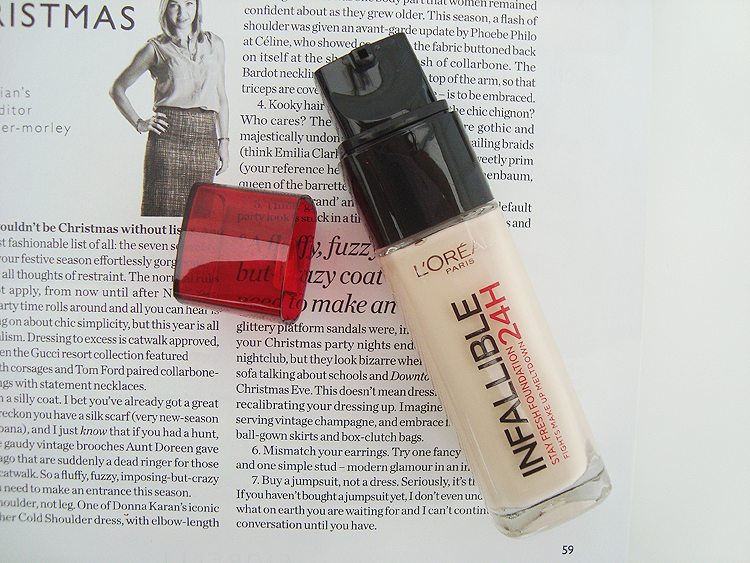 The L'oreal Infallible 24HR Foundation is housed in a sweet little glass jar with a pump for distributing the product. The consistency is normal and standard for a liquid foundation and not thick and creamy like the Sephora foundation although this isn't necessarily a bad thing. I need a couple of small, short pumps to cover my entire face and the results? Amazing. Astonishing. I am converted! 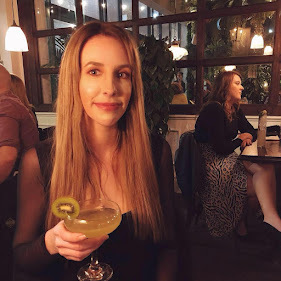 I like to have high coverage foundation to cover my rosacea and I find that whilst some foundations might initially cover my red toned skin, it eventually wears off throughout the day leaving me looking rather flushed. Not with this foundation though. It covers my blemishes and red skin perfectly without making my skin looking cakey which is everyone's worst nightmare. It is a dream to apply and incredibly easy to blend and best of all? It stays in the same place all day long. It doesn't transfer or wear away at all, nor does it heighten my oily T-zone. In fact, unlike my other foundations I don't need to apply mattifying powder. For £9.99, I am incredibly impressed with this foundation. It is one of the best foundations I have tried. It stays put all day long, covers all blemishes and most importantly, its shade range caters for pale people alike. I've heard so many good things about this foundation as well as its primer. I think I'm going to try it out next when I've run out of my current Rimmel one. I recently picked this foundation up and I was amazed at how long it lasts. Now I've worked out how to blend it best I will 100% be sticking with it.